AirLink® Management Service (ALMS) is the most powerful, lowest cost way to manage your fleet of AirLink® Gateways and Routers. Register now to have full access to the most comprehensive remote device management application for your fleet of AirLink® Gateways and Routers (available for LX, RV, MP, GX, LS, ES, Raven, PinPoint and MP families). Access to ALMS is included as part of AirLink® Complete, and is included for the first year with supported device purchases. Manage your gateways and experience how simple it can be to manage deployments of any size. Complete the signup form now to create your account! ALMS is a device management cloud application that configures, deploys, and monitors any number of AirLink® Gateways remotely. 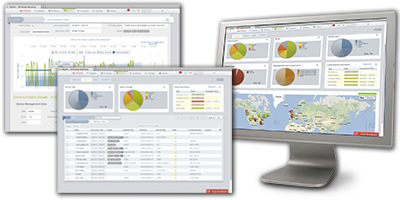 Monitor – remotely troubleshoot devices with an interactive dashboards that provides at-a-glance views of entire deployments. Configure – modify parameters and get all your gateways on the same configuration with just one click. Upgrade – automatically receive firmware upgrades and easily push them over-the-air to your group of gateways. Thanks for your interest in AirLink® Management Service. You will receive a second email when your access to AirLink® Management Service will be activated.